What causes a form to be unavilable? What needs to be done to allow people to sign in to this jot form? Repeatedly this morning we have tried to sign up at the form below. See screen capture. I was able to replicate the problem when I submitted your form https://form.jotform.com/53007249810955. I believe this is because of the mismatched number of submissions in your form's limit. 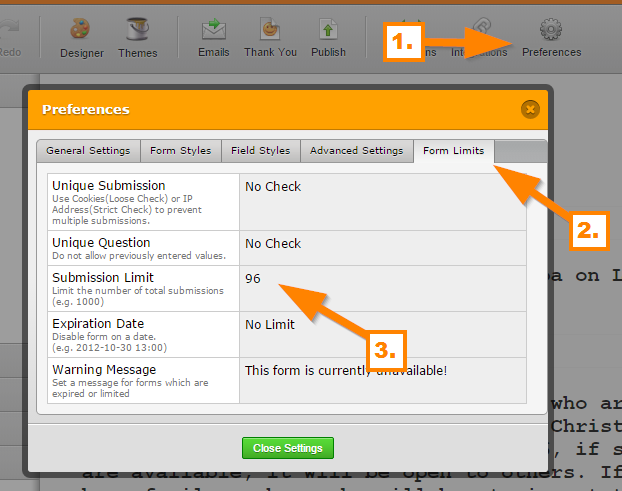 In your submissions, you have a total of 98 submission, while the limit is set to 96 (which is lower). This prevents the form to submit. It would be best to match the number of submission with the limit to avoid this problem.